Beautiful rug! We have had this for over 2 years in our office, and it has held up so well! I plan to buy in a larger size for our bedroom. Expert hand carving and raised high-low loop construction give this area rug extraordinary touch appeal. The rug is the perfect addition to high traffic areas, either on wood or on carpet, to protect your floors from wear and tear. Sublime shading in subtle gradations of grey impart a damask design with an intriguing air that will lend an exotic allure to any setting. The floral pattern will add beauty and elegance to any room in your home. 27.0 In. X 6.0 In. X 6.0 In. Dimensions 27.0 In. X 6.0 In. X 6.0 In. 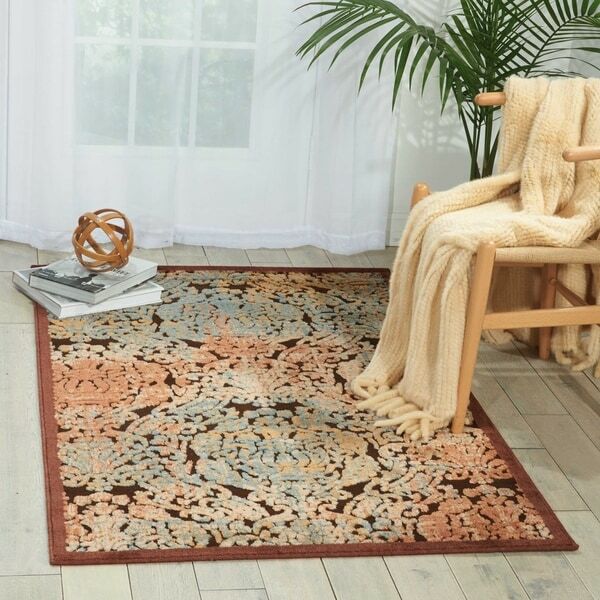 Yet Another Great Rug from Overstock! The high quality and great values just keep rolling in from Overstock.com! (Ha ha, rolling) After purchasing an off white shag rug for my living room from Overstock for $*** that beat out a $2,000 rug from Room and Board, I think I've found my forever rug company. Why would you shop anywhere else when you can get this kind of quality for these prices!? I have a fairly large entryway, and needed a rug that would serve as a front door "wipe your fee" rug, and be large enough to go under the entryway bench behind the front door where we sit and take off our shoes. This size is spot on! The color is rich, there's variations of tones and the Damask pattern does not scream "Traditional," because of the burn-out design. It's actually quite hip, and works well with the Mid-Century Modern look we're going for. My walls are pale gray and my floors are dark Cherry. It's perfect! The design of the rug will not compete with my Black Walnut and raw steel entryway bench that I spent a fortune on, which is good. Two thumbs up on this rug! This is the 2nd version of this rug I have purchased. I bought the first one 6 months ago, and just purchased this size as a coordinating piece. It was an amazing purchase! High quality, very little shedding, no odor upon delivery. The color is as pictured, although side by side one rug looks a bit more grey while the other is a bit more purple, so there must be some slight variation in the product. That said, the color difference is hardly noticeable. This rug is in a very high traffic area and often has food, etc. spilled on it. It cleans up easily, and the design entirely camouflages any minor accidents. I have these rugs on hard tile, one with a quality rug pad and one with just a non-stick pad. While it is comfortable in both cases, I recommend the thicker rug pad. Highly recommend!!! 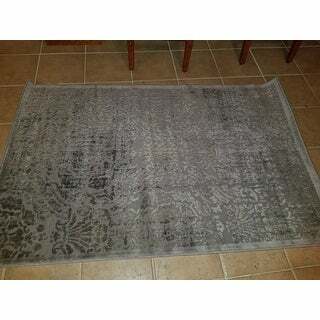 I bought this runner to go with the area rug that I had order for my dining room. The colors are subtle and the carpet is very soft. It is a beautiful area rug. This rug is great! I thought it would be a good rug for the entry way, the color online looked like it could handle all the foot traffic. When I unrolled it, I was so pleased! It has a burnt out damask pattern that I think more visible than shown in the picture. I hope it comes bigger for my living room too! I was looking for a nice rug for my 15 year old sons bedroom. I ran across this rug by chance and it was exactly what I was looking for. I ended up ordering two of the same size. If you are putting on hardwood I would recommend using a rug grip pad underneath. The colors vary in shades which give the rug an upscale appearance. The pattern is a raised pattern that feels like felt when you fell it. I would recommend this purchase! I also received the rug 2 days earlier than expected! Great rug with a very nice pattern design. The color is a soft brown/cream-grey that gives it a fresh modern look. It is very soft to the touch and very comfortable. It is more like a thin rug and somehow easy to spot clean in case of a spill. If used without any heavy furniture on top of it I would definitely recommend getting a non-slip rug pad to keep it in place. This is a perfect rug for high traffic areas. It is holding up great! This rug resembles the picture. It has a slight uneven surface with gradations of color, low pile. It adds a touch of elegance to the room looking antiquey and warm. Because the color seems to change, it can look good with a variety of color schemes. I used this rug in the bedroom and it made everything else look better. Great look for my living room. The colors have soft hues of lavender and grey tones. A rug that is universal for any setting in the home. LOVE the raised look and feel of the rug. I would definitely make future purchases on this brand! Exactly what I thought I was ordering. True gray with lighter and darker shades running through and then a little brownish gray randomly swirled in. Has the vintage look I wanted. It's actually a beautiful rug, but doesn't overpower the room. Compliments my furniture, but doesn't disappear. Maybe the picture portrays it to be a little more worn than it actually appears. (It's NEW; it isn't worn at all.) But I think that's the color variation. Don't know how you can go wrong with gray. The color is not gray. Not blue. Somewhere in between. It just looks dirty. There are color roll marks on this rug. *** restock fee plus the price and hassle of shipping it back? I'll keep it and not ever buy another rug that I don't get to see first. I'd rather pay full price and get what I want the first time around. You really can't get a good idea of what this looks like from the photo - in some areas it's just the base of the carpet and in others there is carpeting, giving it an odd thread bare look. There was also a bit more purple in it then I was looking for. I guess it's a nice rug, just not what I was looking for. This rug is nice for the price. The color wasn't exactly as pictured. It looked like it had a lot of gray so I could not use it where I had planned. I would recommend it though. It was a pretty rug that I just couldn't use because the color was not quite right. Rug was so thin that the ends curled up from being rolled up during shipping with no hope of going down. I left it out for 2 days hoping gravity would do its part (I even tried taping the end down) but because it's so thin & low quality...the ends stayed rolled up. Would not recommend. Great Rug for the price. The color is a little darker than expected with more tones of purple than I initially thought. But a beautiful rug overall! wow it is better then expected. saw this rug and was excited because it had a vintage look but was new. and it is perfect!! thx overstock! This rug was attractive and looked well-made. It didn’t fit the space that I purchase it for so I returned, but there was nothing wrong with the rug itself. I really love this rug's low pile and distressed look. Very cheap looking. Looks a lot cheaper in person than pictures online. However, I use it for my entryway since there is high traffic there and people wipe their shoes off in that area. I’m going to be donating it to Goodwill soon. I bought this rug for my entry and liked them so much and how they cleaned up I bought an extra when they were on sale. Very affordable. This rug is beautiful but wished the color was more cream instead of grey! Rolled out flat and great size for the guest bedroom! Beautiful runner. Brightens up my hallway. Colors are muted but eye catching. This is not a flimsy thin rug. It is thick and cozy underfoot. You will not be disappointed. "In some of the customer photos, it looks like brown vines. Is this correct when you’re up close to the rug? " This rug has tones of grey, black, ivory, and brown. "Does this rug have a non slip backing? Thanks!" No this does not have non slip backing. A rug pad is recommended. "Is it more grey than ivory or beige"
"will this rug work in my kitchen"